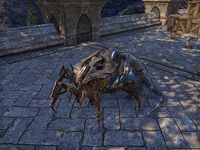 Gather some parts to repair an Argonian's pet Dwemer construct. Neetra's pet—a Dwarven construct—has broken down. She wants me to steal parts so that she can repair it. Neetra is located just outside the Mages Guild tower in Skywatch. She will be working on her pet — a Dawrven spider named Has-Many-Legs. "Hey there, do you have a moment?" "My little construct is sick. I want to repair him, but Telenger expressly forbade me. Says the parts are too valuable, that they shouldn't be wasted on a pet. But Has-Many-Legs is such a sweetie." I could get you some, if you want. "Thank you. I happen to know some of the nobles in town collect Dwemer parts as baubles. If you could find me a ring, a gear, and a tube, I'd have Leggy jumping around good as new in no time." "It should be easy to grab those baubles and get back before anyone's the wiser." The nobles' houses are all located in the northwest part of the city and have simple locks on their doors. The easternmost one, closest to the Mages Guild, is Ambarel's House, and contains the dwarven ring. It looks empty at first glance, but be careful, as upstairs you will find a Burglar. She will yell, "Boy did you walk into the wrong house!" and attack on sight. When she's dealt with, the storage chest with the ring is yours for the pillaging. The second house is Tuunerol's and is near the bank. A guard patrols nearby, and if you aren't quick enough while picking the door they may spot and apprehend you. There's no opposition within, so nab your prize, the dwarven tube, from the trunk upstairs. The last house, Ingamircil's, also has a guard patrol outside. Otherwise, the house provides no surprises, just a chest on the second floor with the dwarven gear. Take it and return to Neetra, still by the Mages Guild. I ran into some trouble, but it was nothing I couldn't handle. "I'm sorry to hear that. But at least you found the parts. I'll fix Leggy up good as the day he was forged. From where my heartwater wells up, I thank you." I need to collect a Dwemer Ring, a Dwemer Gear, and a Dwemer Tube from the noble houses in Skywatch. Finishes quest I have the parts Neetra wanted. I should give her the good news.